Kazakhstan’s national carrier Air Astana is preparing for the introduction of its first Embraer E190-E2, which is expected later this year, thus becoming the world’s second operator of the re-engined Brazilian-made regional jet after Norway’s Wideroe. Ahead of the launch, the Kazakh airline has been in regular contact with the manufacturer, focusing on the procurement of components, ground equipment and tools. 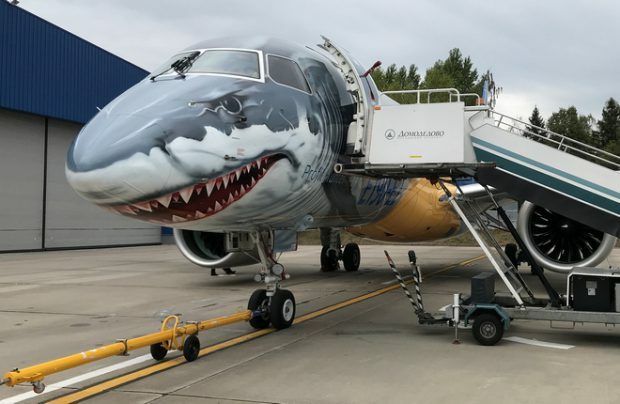 “By the time the first E190-E2 is delivered to Air Astana, the airline will have the flight crews and maintenance staff all in place, as well as other services involved in operating the aircraft,” Embraer’s representative told ATO.ru, Russian Aviation Insider’s sister publication. Air Astana expects delivery of its first E190-E2 before the end of this year. It has placed an order for a total of five of the type as replacements for its existing E190s, the leases for which expire in 2019. However, Air Astana’s president Peter Foster earlier told Russian Aviation Insider that the airline is planning on further expansion of its Embraer fleet. The airline’s in-house maintenance base will be responsible for servicing the new-generation aircraft. The facility is currently undergoing a certification process, which is scheduled to complete before the first aircraft enters service. Air Astana currently holds EASA Part 145 approval for line maintenance and A-checks on the Embraer Е190. “The trend will continue for the E-Jets Е2. The company’s engineers are currently undergoing training at the Embraer Training Centre in Brazil,” the representative for the original equipment manufacturer (OEM) revealed. Other Embraer operators in the CIS and Russian region have been proactively organising maintenance facilities for their fleets too. “When large players in the Russian air travel market started operating Embraer aircraft, they embarked on developing their in-house capabilities for their maintenance,” an Embraer representative explained. “For instance, S7 Airlines’ MRO needs for their fleet are completely covered by S7 Engineering and Sibir Technic, which are expanding their component base for E170/E175. The trend is likely to be followed by new Embraer operators in the region, who see themselves as independent organisations for continued airworthiness of their aircraft. In addition, S7 Technics already holds approval for training engineers for E170/175 in the categories B1 (mechanics) and B2 (avionics). The presence of such a training centre in Russia provides great opportunities for those technical centres which plan to maintain Embraer aircraft in the future,” the representative added. He also mentioned that Pegas Fly (part of Pegas Touristik, along with sister carrier Nordwind) is expected to take delivery of its seventh Embraer E190 this month and is on track to becoming Russia’s second largest operator of Embraer jets. It has contracted fellow provider NW Technic for maintenance of its fleet. The organisation is licensed for line maintenance and A-checks on the E190. Regarding E-Jets E2 maintenance, the representative of the OEM explained that those maintenance facilities that already have the capabilities for the E-Jet family, will easily upgrade to the next-gen. The manufacturer has made a contributory effort in reducing the maintenance costs for the E2 family, including extended inspection intervals and time between overhauls (TBO). The interval between heavy checks on the E2 has been extended from 7,500 to 10,000 flight hours. Landing gear TBOs for the E2 is now 12 years. “The new generation E2 has 75 per cent of its components and systems designed from scratch. The remaining systems are those that have demonstrated the highest reliability throughout the operation of E-Jets. It’s a completely new aircraft with a new engine. All of the system suppliers are very familiar with those airlines which have experience in operating Airbus and Boeing aircraft, so we anticipate they won’t encounter any difficulties in continued airworthiness of their E2 fleets,” the representative emphasised. Those MRO organisations ambitious to become Embraer authorised maintenance centres, will have to undergo the manufacturer’s audit to confirm their compliance with the OEM’s standards. Embraer itself currently has two maintenance centres in Europe and in North America but, thus far, there are no authorised centres in Russia, even though there are a dozen located across the world. They enjoy certain privileges when purchasing spare parts and components, and are recommended as priority maintenance providers to new Embraer operators. Logistics centres are based in South and North America, Europe, China and Singapore. The Brazilian OEM also offers a number of partnership options, which include participation in spare parts pools and for the exchange of components. “Thanks to these programmes, our customers demonstrate the highest levels of dispatch reliability – exceeding 99 per cent – which translates into just one delay for technical reasons lasting more than 15 minutes occurs for each 100 flights,” Embraer says.